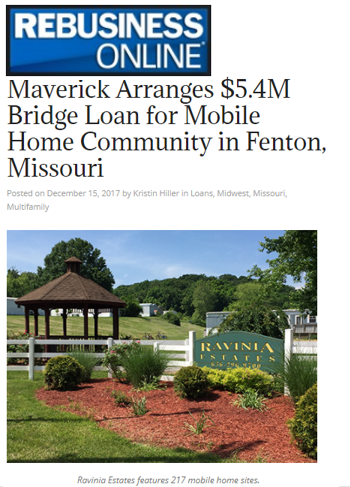 Maverick Commercial Mortgage has arranged $5.4 million in bridge and subsequent permanent financing for Ravinia Estates in Fenton. The 217-site mobile home community spans 74 acres at 1103 Robindale Drive. Maverick arranged the 10-year loan on behalf of the borrower, JWW Robinland LLC. The bridge loan enabled the borrower, a private real estate investment firm, to fully renovate the infrastructure of the park including new signage, retaining walls, perimeter fencing, new office, parking lot, new asphalt, sealcoating and significant tree removal. The borrower invested in excess of $150,000 in capital improvements. Maverick was then able to secure permanent financing that paid off the existing bridge lender, returned equity to the borrower and paid for closing costs.